Two Nigerians, believed to be the masterminds of a Macau Scam syndicate, were today charged at the magistrate’s court with criminal conspiracy. 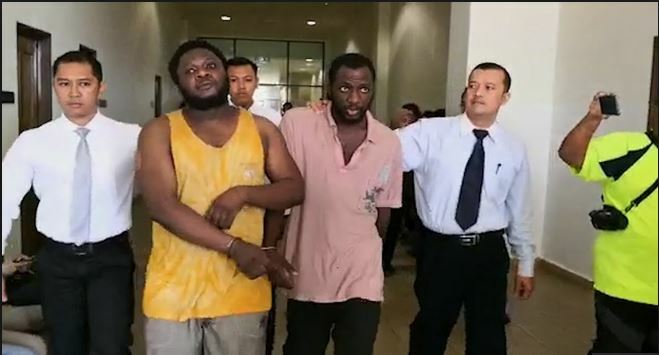 Egwuasu Bernard Nnaemeka and Egwuasu Chimiezi Benjamin, both aged 32 were accused of committing the offence by cheating former teacher Nor Faizah Othman, 48, between April 21 and June 12 last year, causing the victim to suffer a total loss of RM148,490. They were charged under Section 120(B)(1) of the Penal Code, read together with Section 411 of the same Act, which carries a maximum penalty of five years’ jail and a fine. The accused pleaded not guilty to the charge read before magistrate Nurunaim Abdullah. They were denied bail and Nov 23 was fixed for mention and appointment of counsel. The duo, who were studying at a private higher learning institution entered the country in 2016. In the same court, tile shop worker Tee Chiu Hang, 29, was fined RM4,000 after pleading guilty to a charge under Section 411 of the Penal Code for accepting money transferred by the victim into his account. Tee was accused of receiving the money through several bank transactions at Jalan Beserah, here, between 12.15pm and 2pm between April 21 and June 12 last year. He told the court that he befriended the duo through Facebook three years ago, but denied ever meeting the men. He also admitted to handing his automated teller machine (ATM) card to the accused which was in their possession when they were arrested by the police on Sept 21.